Once the lesser known cousin of Coorg, ‘the other coffee county’, Chikmagalur has quickly risen as a getaway destination for Bangaloreans. While luxury can be enticing, in a place like Chikmagalur, nothing beats waking up smack in the centre of a coffee plantation with birds chirping and looming mountains as your morning company. 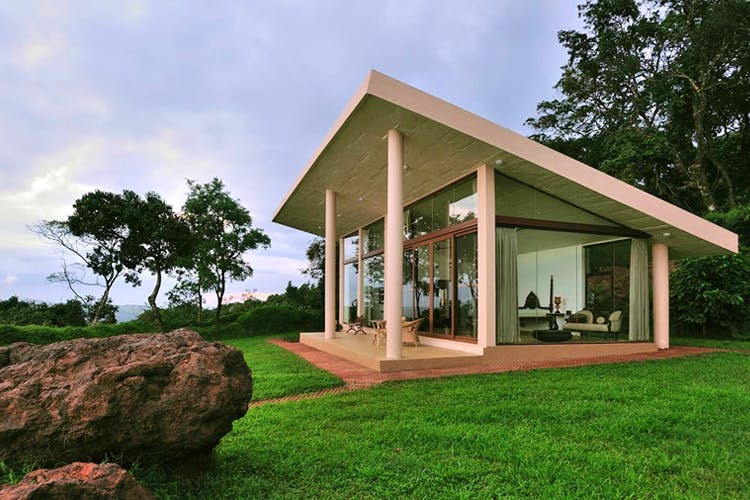 We have hit up the coffee trail and picked the best homestays and places to stay in Chikmagalur without breaking the bank, but also without compromising on the luxe factor. Just a short drive from the town of Chikmagalur, this one is quite a hideout. There are three spacious double rooms, which can accommodate three in each. But then again, if you’re a bunch of youngsters who don’t mind really piling on, then even up to 20 can be accommodated. What’s great is that they let out the home to only one set of people, so you can really let loose and take over! Want to hide from city folks? Splendid plan. Go here. Set in the wilderness and well away from prying eyes of neighbours, it’s great for a romantic break. The lovely Padma Aunty will take care of you like you’re family, so no need to worry about food and feeling comfy. Plantation walks and campfires are a regular feature here, especially in the chilly winters. After raving about it here, we are eternally yearning to go back to this luxury homestay. The four cottages with old-world charm beautifully fit into the modern amenities like the infinity pool, jacuzzis and ATV rides across the plantations. What’s not to love, eh? Price: INR 12,000 (approx) for two including all meals and two outdoor activities. You can call one of five bedrooms home in this 100-year-old heritage house, complete with a courtyard and fireplace. Or pick from their quirky cottages (the Rocks Cottage is adventurous). There’s even a private library and lake in-house so no need to leave the premises for entertainment at all. Malnad cuisine is served and you won’t get enough of it. All rooms have differently beautiful views of the Mullaiyangiri range so no need to squabble when picking. Price: INR 2,250 (approx) per room. Cottage rates on request. Nothing beats heritage, nature and luxury, all together. So you can see why Thippanahalli’s 230-year-old history trumps most things! Antique on the outside, the insides have been refurbished to offer you five rooms — the newest being Arabica and Robusta. Pea Berry is the dining area where you can meet and greet other guests. Our personal favourite spot is the manicured lawns, coffee in hand, marvelling at Mullaiahnagiri, the tallest peak in the state. Opening up their ancestral estate home, Shreedev and Susmitha, are the ideal hosts. Five rooms are on offer, each with their own charm, so don’t go expecting hotel-esque accommodation. A dreamy fireplace makes things cosier, especially after you’ve ODed on the Akki Roti and Koli Saaru (chicken curry) the house special. This place is perfect to curl up with a book and enjoy the peace and serenity. With copious amount of coffee on hand, of course. Keep Mondays free for a visit to the local shandy. Hollywood meets coffee plantations not only in the name but in experience too. Dramatically fluffy beds in charming cottages set against the Bababudangiri mountains is really quite picture perfect. We love waking up to the smell of coffee and waltzing (yes, dancing replaces walking in this set up) in their Japanese-style garden. Don’t forget to bring home their fresh coffee in home-made bags. No commercial stuff here. A slice of heaven, Primrose Villas takes luxury to a new level and we’re not complaining. The villas are something out of the Hamptons. Decked out with Victorian and Jacobean era furniture, you’ll never want to leave the rooms, especially since they all have glass walls so you don’t miss a single bit of the natural beauty around you. Check out our experience at this place, here. Oh, how we love ourselves some indulgences. And we mean solid wood four-poster beds, a basketball court, a swimming pool to cool off in later. Plus, you know, mist-covered mountains, endless coffee plantations, the smell of pepper in the air and a well-stocked bar! The place can accommodate up to eight comfortably, but they’re happy to squeeze in groups if you’re OK with it. Price: INR 3,000 (approx) including all meals. To start with, we love the coffee bean trail which follows your cursor when you check out their website. So the experience with coffee really begins then! Another ancestral property (the Indhavaras rule the roost), this is one is massive and can easily house up to 18 guests. There are cottages spread across the property, so privacy is a plus point, but the lovely design of the place is compelling. Think rock gardens, stone paths and traditional South Indian antiques adding to the resort-like ambience. Oh, there’s no television or mobile network — a definite plus point if you’re really trying to escape the madding crowd.